The all-new Mitsubishi Shogun Sport will be priced from £36,905 when it goes on sale in the UK in spring. 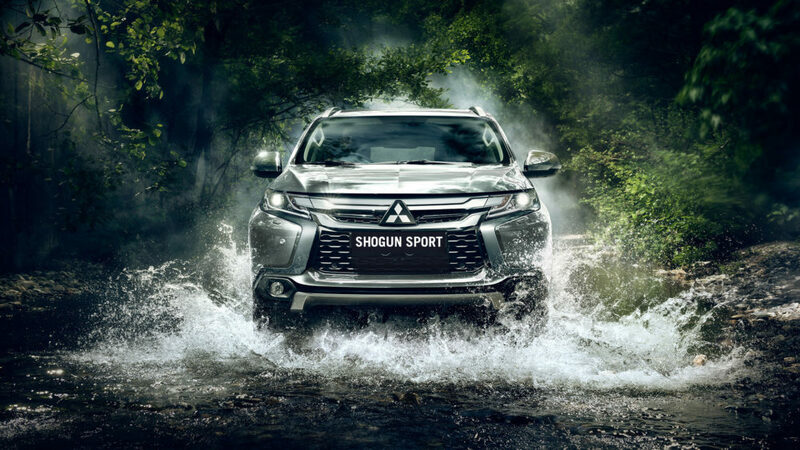 Closely following the January arrival of the Eclipse Cross, the seven-seat Shogun Sport will sit between Outlander and Shogun in the range and will be offered with a choice of two trim levels: Shogun Sport 3 and Shogun Sport 4. Both versions will be equipped with an all-aluminium, 2.4-litre turbodiesel engine that produces 179 BHP and 317 ft lb of torque combined with Mitsubishi Motors’ Super Select II all-wheel drive system and an all-new, eight-speed automatic transmission. The Super Select II all-wheel drive system allows the driver to switch seamlessly between two-wheel drive and four-wheel drive on all terrains. On tarmac, this means that drivers enjoy optimum efficiency in two-wheel drive mode, but can switch to four-wheel drive for extra stability when towing or in slippery driving conditions. The standard specification also includes Hill Descent Control, Trailer Start Assist (TSA), Hill Start Assist (HSA) and a dedicated off-road mode. Shogun Sport combines luxurious space for up to seven people with outstanding versatility and practicality, offering up to 1,488 litres with the rear seat folded. The entry-level Shogun Sport 3 includes such features as leather upholstery; electrically-adjustable front seats; power folding mirrors; LED headlamps, tail lamps and DRLs; dual-zone climate control; reversing camera with rear parking sensors; keyless entry with push-button start; privacy glass and automatic headlamps and wipers. Bluetooth connectivity with music streaming is also standard, as is the Mitsubishi Motors Smartphone Link Display Audio (SDA) system which allows users to connect to apps or other features of their Apple or Android smartphone through the touchscreen or via voice control. Priced from £38,905, the Shogun Sport 4 adds heated front seats; the Mitsubishi Power Sound System with additional tweeters and a 510W amplifier; headlamp washers and Mitsubishi Motors’ most advanced safety and driver assistance systems including Adaptive Cruise Control (ACC), Forward Collision Mitigation (FCM), which uses radars in the front grille to judge whether there is risk of a collision with the vehicle in front, Blind Spot Warning (BSW), a 360˚ view camera and the Ultrasonic Mis-Acceleration Mitigation System (UMS) which utilises front parking sensors to halt any accidental sudden acceleration when any obstacles are detected nearby. All Shogun Sport variants are available in three metallic shades – Deep Bronze, Atlantic Grey and Sterling Silver – plus pearlescent Imperial Red and solid Polar White. Cosmos Black pearlescent paint is also exclusive to the top-of-the-range version. As with the rest of the Mitsubishi range, Shogun Sport will have a five-year/62,500mile warranty.